To many, the only church in memory is our present structure, but Central goes back much further. Indeed, its roots are so deeply embedded in local history; it is difficult to separate the two. In 1841, Cleveland County was formed. James Love and his wife Susan gave 147 acres, in what is now the heart of Shelby, for a county seat. William Forbes, later to become a member of Central’s congregation, gave 50 acres to make up the western section of the city. The two gifts provided for schools, a city hall, court square, and a building lot for all recognized denominations – Baptist, Presbyterian, Episcopal and Methodist. By March of 1845, when Cleveland County was just four years old, the first Quarterly Conference for the Shelby Circuit was held here. (At that time, Shelby was in the Spartanburg, SC District). A Building Committee was appointed. But meanwhile, the approximately 25 member congregation needed a place to meet. Dr. Thomas Williams, a Baptist, let the small group meet in his office, which was one of the first buildings in Shelby. 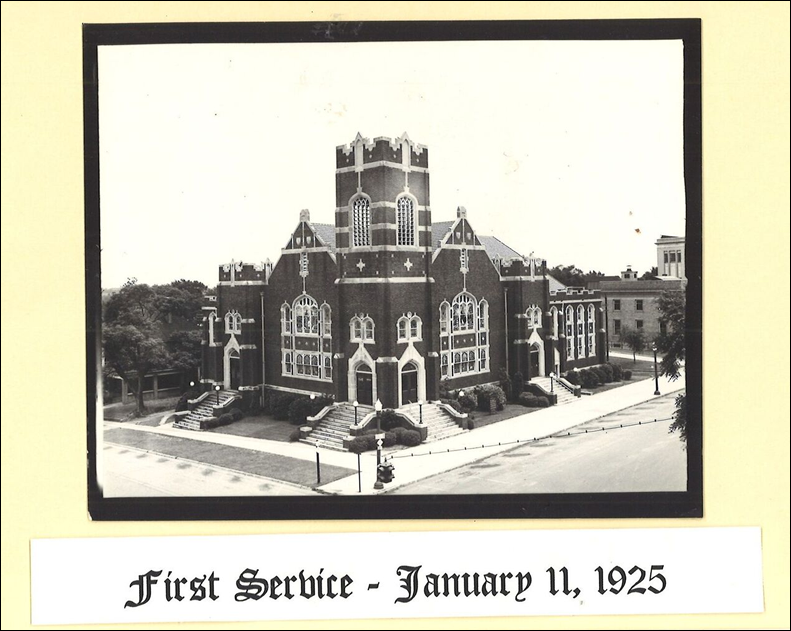 By summer of 1845, the group was ready to move into Central’s first church, a one-room wooden structure on the corner of East Warren and South DeKalb, where the BP Service Station is now located. Directly across the street (where Shelby Savings Bank is now located) was the jail which the county had built a few years earlier. By 1878, the church was ready for larger quarters, so the building was sold for $450 to make a “nest egg” for the new building at the corner of Washington and Marion Streets, where Gragg and Gragg is now located. 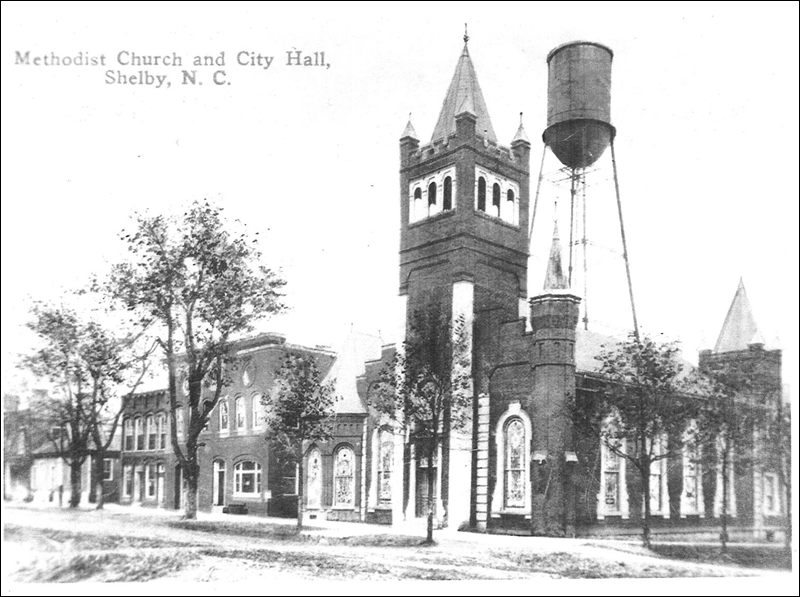 This building was completed in 1884, but unfortunately plumbing and water were not available from the city of Shelby until 1908, the same year in which the Sunday School classrooms were added to the building. During 1922, while Rev. Edgar Poovey was pastor, it became evident that problems with the furnace and various other needed repairs were insurmountable. It was time to build a new church! Rev. Alfred Leland Stanford, recognized as a “building pastor”, came to Central and began work on a new building at the present site. 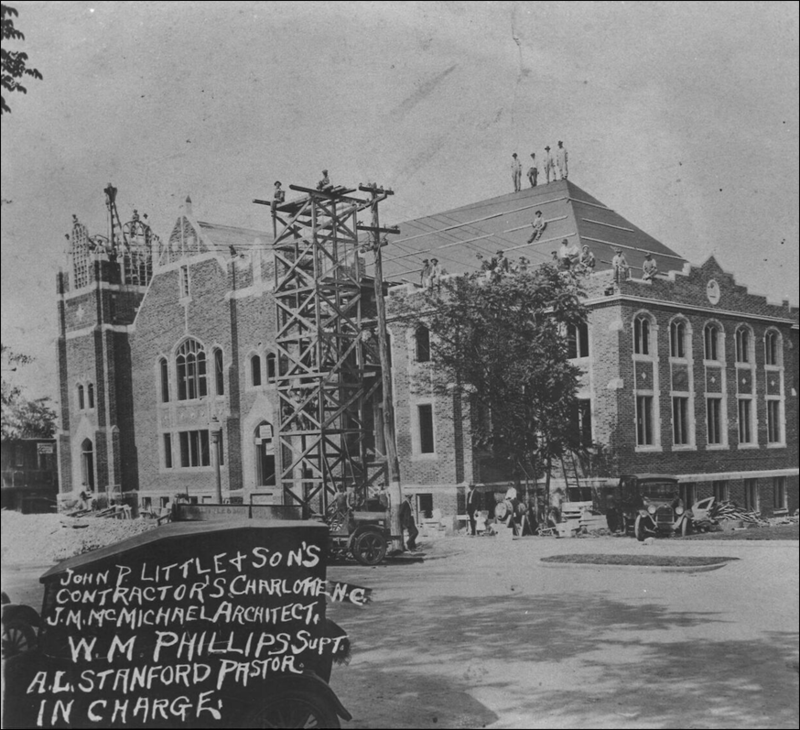 On January 11, 1925, the first sermon was preached in the new building. At that time, the church was known as Central Methodist Episcopal Church, South. During the 1930’s, one of Central’s Sunday School classes became widely known throughout the state. Its teacher was Clyde R. Hoey, whose oratory later helped carry him to the Governor’s mansion. The class membership exceeded 300 men, meeting in the “south pasture” where the present class still meets every Sunday morning as the Hoey Bible Class. A milestone was reached in June 1939, when the church celebrated the payment in full of the existing church debt. During the 30’s and 40’s the church parsonage was a two-story house down the street from the church. At that location today is the parking lot for the county courthouse. The present Duke Street parsonage was purchased in the 1950’s. By the late 60’s, it was evident a new Education Building was badly needed, and work was begun. The new building was dedicated in 1968. The debt on this building was paid off in three years. Since the 1970’s the church structure has had its interior rearranged to better serve Central’s membership. From time to time paint has spruced up its walls. During the late 1990’s and early 2000 the complete heating and air conditioning system was replaced or updated. This brief history deals, of necessity, with dates and times buildings and structures. But the real history of Central is written in the lives of its members and in their spiritual journeys, both individually and collectively. Since 1845, our members have had a vision and the courage to meet the challenges of the times. Let us pray that some future historian will write the same lines about Central United Methodist Church of the twenty-first century. The current History Room was the project of Central’s sesquicentennial committee chaired by Caroline Laney and Billie Ann Haynes, church historian. The space has grown to include two historical display rooms and one workroom. The area is a mirror of Central’s past, a collective effort for the present, and a plan for the future. The items in the room have been donated throughout the years from the personal collections of many church members.